CANOEING, RAFTNG, HIKING, OBSERVING WILDLIFE, FISHING, SLEEPING CHALET AT BASE, CAMPING TENTS, EATING A TRADITIONAL MEAL AT AN AMERICAN INDIAN CAMP. In the wilderness, in the heart of the forest, we adopt the lifestyle and transportation of Indians and trappers. You will discover the boreal forest with its lakes, rivers, beavers, wolves, bears and moose in their environment, and receive an explanation of their lifestyles and habitats. - In the heart of Québec, we adopt the lifestyle and transportation of the American Indians and the trappers. 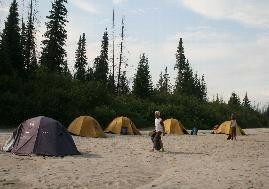 - 3 days canoeing on the Mistassini and Ouasiemsca rivers. Introduction to canoeing down the rapids, for those who want it. - Cycling and hiking in the heart of Pointe Taillon park, with kilometres of beaches along Lac St Jean, and a high density of moose and beavers. - Enjoyable itinerary tailored to the profile of participants. Many possibilities allow us to find an alternative in case of inclement weather, or adapting to all from age 4. 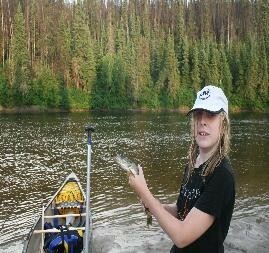 - Discover the boreal forest with lakes, rivers, beavers, wolves, bears, moose in their environment. Explanation of their lifestyles and habitats. 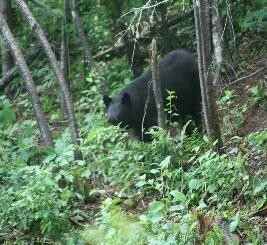 - Safari to see a Black Bear. - Suitable good quality equipment: a canoe and a tent (places for two people). - Different aspects of Canada are learnt from the traditional to the modern . DAY 5 Observe wolves, experience American Indian culture, sleep in tents by a lake. 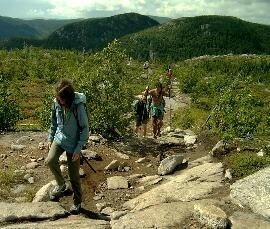 In the afternoon, your guide will meet you in Quebec City (airport or hotel) to take you in a minivan to our base camp. You travel to the "great north" through the immense Laurentian Fauna (animal) Reserve, having your first view of the Canadian wilderness. At the base camp, at the edge of the forest, you will find a simple warm and comfortable double room in a CHALET. The base camp is north of Lake Saint Jean (Lac Saint Jean), on the edge of an immense wilderness, dotted with lakes and crossed by several rivers. There, the paved roads end, and adventure in the wilderness begins. Awaiting you is the vast forest scattered with lakes and rivers: the great north in all of its glory. Then we return to our base for dinner and overnight in a chalet. After having breakfast and checking our equipment, we leave our base camp and go to our embarkation point on the Mistassini River. We are then in the wilderness in the heart of the forest, where our canoe expedition allows us to trace the history of the "discoverers of Canada". We have lunch in a small secluded cove, where we can swim from a sandy beach. or from our canoes. Late in the afternoon, we set up camp for the night and prepare a fire and a meal, as in the days of the trappers. Continue our descent, with varying landscapes on each shore. Lunch en route. Return to our base in the late afternoon. Dine and sleep in a chalet..
After waking up to the singing of numerous birds in the park, and having breakfast, we continue the activities of the previous day. After lunch, we return to our base at Girardville. In late afternoon, we have a short ride to our prepared site, to observe a black bear in the forest, directly in its territory. With luck, it will be there for an unforgettable meeting. Return to our base for dinner and overnight in chalets. After breakfast, go by minivan to the very large Wildlife Park, in St Felicien, the only one of its kind in Quebec. http://zoosauvage.org/en/ See animals of the north, free in their natural environment.. Walk to see polar bears, a beaver dam etc. Ride, in a new train, see moose, lynx, cougars, deer, bison , foxes etc. Return to our base for lunch. Then visit the kennels of our sled dogs (huskies, malamutes) followed by the opportunity to hike on the trails in the forest near to the chalets and/or visit our wolves, in our private park, and learn about their hierarchical society. Followed by an evening meal before retiring to bed in your chalet. CANOES equipped for 2 people, including life jackets. TENTS (3 person) for 2 people, floor mats, waterproof bag. FOOD: Prepared on site from local produce for various menus of the region, a way to become acquainted with the Quebec culture. Grills on wood burning stoves and many other exciting moments to share. PASSIONATE professional guide(s), with an excellent knowledge of wildlife, able to offer you an experience close to nature, in the wilderness. Members of our professional team have extensive experience, a profound knowledge of the terrain, where we operate, and the qualifications needed to supervise the activities proposed. They have the knowledge and tools necessary for your safety: CPR, first aid in remote areas, wilderness survival, telephone, map, compass and GPS. 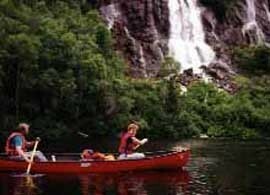 Also, the company is part of Quebec Ecotourism and meets all current standards of quality and safety regulations. COMMITMENT: must have a positive attitude towards an outdoor community life. EXPERIENCE: no experience is required to participate in this expedition in a canoe. One or more guides will be with you to teach you canoeing techniques, and how to paddle without getting exhausted! Bivouacs and a warm atmosphere of isolation in the wilderness allow you to quickly forget the toils of the day. SCHEDULE may be modified for reasons of security, weather, and/or unforeseen circumstances. If you do not want to take advantage of our shuttle service from and to Quebec City, and come directly to our base, there will be a reduction of $175.00 for each adult, and $100 for each child.There is a bus service from Montreal and Quebec City to Albanel (the closest stop to our base-25 km-) where we will pick you up, and take you back free. When you arrange your trip to Quebec City, to recover from “jet lag”, we suggest that you spend a night or two there, so that you can relax before and after your active holiday. and enjoy seeing its attractions. Quebec City is Canada's oldest city and a World Heritage Site. This beautiful and historic capital city of the province is often called "the cradle” of French civilization. You could wander in the old part of this walled city, including the fortifications on the Plains of Abraham (site of the battle for Quebec City in 1759, between the English and the French). Then, to see more of the charms of the City, you could ride in a horse drawn carriage, and/or stroll along its cobblestone streets, where boutiques in ancient stone buildings nestle beside churches and monuments, artists sketch portraits, as you watch, and a wide variety of restaurants offer you enticing menus to dine in this French Canadian gastronomic centre.